Scroll down to see our selection of Chairs and Seating for sale. Chairs and Seating This section of our web-site includes a variety of different types of chairs and seating that we offer. Among the items listed in this section, we carry several chairs for the elderly and convalescent chairs, lift out chairs and recliners, bariatric chairs, uplift seat assist products, 3 position recliner chairs, several stool type chairs, many different PVC chairs including Geri chairs, as you search through this section, we are sure that you will find they type seating product that you are looking for and if you don’t, contact us and we will do our best to find it for you. In this section we offer several types of chairs that you may not have been familiar with, such as bariatric chairs, which simply refers to chairs for larger or obese persons that have had a difficult time finding comfortable chairs. Geri chairs or geriatric products, is a general term use for products that aid in the comfort of the elderly or disabled. Lift chairs and uplift seat assist products aid in a person that has difficulty exiting there chair by raising the rear of the chair and lowering the front portion making it easier to get up an out of there chair. As with any of our product we are glad to assist in any questions that you may have. 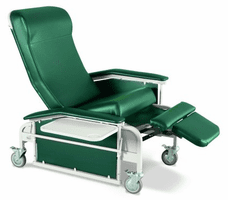 There are many types of seating that is made specifically for the medical environment, facility seating, blood donations and many more styles..